THE EPA TELLS IT LIKE IT IS WITH KAISER RIGHT BEHIND-WILL THE FSD? PLEASE READ THE LAST PARAGRAPHS ON BOTH OF THESE LADIES AND GENTLEMEN. THESE GUYS DIDN’T GET THERE WITH DEGREES IN GRANT WRITING OR PSYCHOLOGY. THEY ARE SCIENTISTS. LOOKS LIKE THE JOKE’S ON YOUR KIDS FOLKS. WELCOME TO THE A.S.C.I.P. NOW SHUT OFF YOUR CAMERA! The boss says you ain’t filmin’ us- Capish? To those of you who know me quite well, June 27th is a very special date. This year has proven to be no exception. Today under a clear blue sky, with the jasmine in bloom and the firework stands going up, The Fullerton Informer showed up unannounced to the ASCIP’s executive committee meeting in Cerritos, which by the way, is a public meeting complete with an agenda, public comment and advanced notice. I just figured golly, what better group to present the potential dangers that wireless classrooms pose to our school children than to the risk managers themselves. Heck no one in the Fullerton School District has given me the time of day so I even felt compelled to share my hypothesis on the EMF connection to Autism as a warning to the pregnant teachers to help keep the Xmods down for the districts and the teachers’ kids from ending up in special ed. I also felt compelled to explain that the FCC guidelines are not safety standards, allow for up to 1000 times the emissions of a cell tower in a classroom, ignore non thermal effects, are like the USDA school lunch hacks calling pizza a vegetable , and a 2000 mph speed limit in a school zone. As is customary in all the public meetings we attend, we bring a camera and some handouts. It turns out that Mr. General counsel himself wasn’t havin’ it. You guessed it, Mr. Feldhake of The Feldhake Law Firm told us we couldn’t film a public meeting that is governed by the Brown Act. We asked him several times and he refused citing that he believed that it would be disruptive. I chose to take the high road instead of waiting for the sheriff to arrive and embarrass him. We will take the recording as soon as it is available. Jeepers, don’t they remember anything from law school? Oh yeah, the Brown Act-that inconvenient truth that haunts all bureaucrats at the trough. This is slightly reminiscent of The Fullerton School District Superintendent, Dr. Pletka and his disturbing letter telling me to basically pound sand when I asked to go into my children’s classrooms at a taxpayer funded public school to film and record EMF measurements in a room full of 35 Ipads humming away cranking out EMF in the kids’ laps streaming back and forth with those industrial strength WiFi routers that are situated right above some lucky students’ heads all day. I digress. Today’s meeting fits all of the aforementioned like a glove. The only thing that was in the hall where we wanted to film was the carpet. We will see what the Los Angeles County District Attorney has to say. Folks, there are millions of kids who will be potentially affected by being locked inside these microwave chambers for over a decade of their young lives with no long term studies on what this stuff does to them. This is being done so that the kids can play with these microwave transmitters instead of those evil textbooks or perhaps for other reasons. Who knows, maybe what we presented today will have sunk in by late August and we can all go back to our daily lives instead of trying to stop what I believe to be the largest forced irradiation of school children that the world has ever seen. Time will tell. If it didn’t sink in, we will be back and they will just have to hear it again. We will keep you posted. GOT MAIL? THEY DO TODAY- SPECIAL DELIVERY TO THE F.S.D. The district, its staff and its board are all clearly continuing to deliberately ignore this information. I have not received one single written response addressing the safety concerns regarding EMF emissions below the FCC guidelines from any of you with the exception of a 3-5-13 email from Mr. Craven with industry funded studies and outdated information. 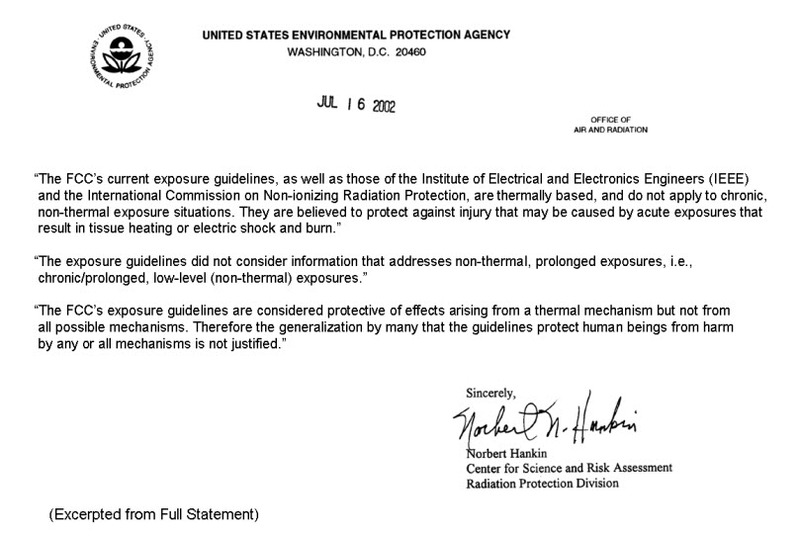 The FCC guidelines are decades old and are based on thermal effects only, and they completely disregard non-thermal biological effects and interactions. Government safety standards almost always lag behind the times. In this case they not only lag behind, but they also ignore an entire range of effects. This is not acceptable when it comes to children’s health. The following experts: http://www.wifiinschools.com/experts.html, have levels of education, scientific understandings, understandings of this issue and qualifications in their respective fields of expertise, which vastly exceed any one of yours, and as such, in my opinion, none of you, are qualified to completely dismiss or ignore their claims. We are requesting an in immediate investigation into this as well as a halt to the deployment and continued use of this technology as we believe that the risk of potential harm to the students vastly outweighs the perceived benefits and convenience. As stewards of the public trust and all the while bearing responsibility for the well being of the students while in your custody, it is incumbent upon all of you to expose yourselves to this information. In my opinion you all need to stop closing your eyes to the reality of the fact that you are potentially harming a large number of children by the continued use of these routers, mandating the use of, and the continued expansion of the use WiFi enabled devices in the F.S.D.’s classrooms. I can be reached via email at joeimbriano777@gmail.com. GOT MAIL? TODAY THEY DO-SPECIAL DELIVERY TO THE FJUHSD. The district, its staff and its board are all clearly continuing to deliberately ignore this information. I have not received one single written response addressing the safety concerns regarding EMF emissions below the FCC guidelines from any of you. 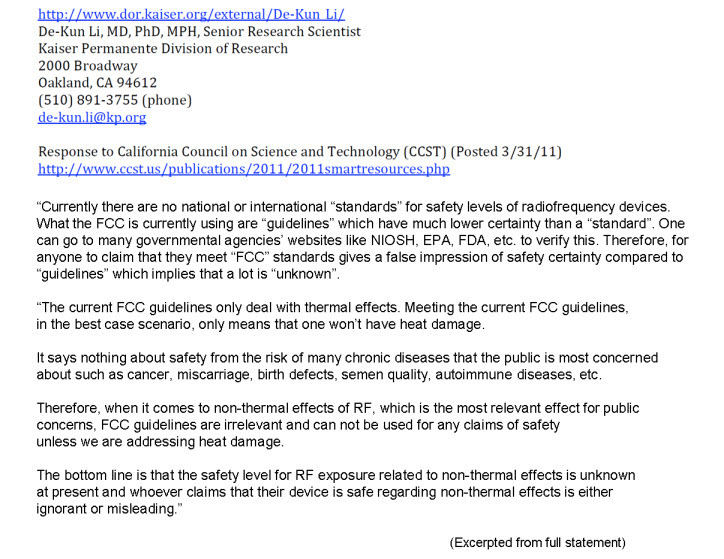 The FCC guidelines are decades old and are based on thermal effects only, and they completely disregard non-thermal biological effects and interactions. Government safety standards almost always lag behind the times. In this case they not only lag behind, but they also ignore an entire range of effects. This is not acceptable when it comes to children’s health. We are requesting an in immediate investigation into this as well as a halt to the deployment and continued use of this technology as we believe that the risk of potential harm to the students vastly outweighs the perceived benefits and convenience. As stewards of the public trust and all the while bearing responsibility for the well being of the students while in your custody, it is incumbent upon all of you to expose yourselves to this information. In my opinion you all need to stop closing your eyes to the reality of the fact that you could be potentially harming a large number of children by the continued use of these industrial stregnth routers, mandating the use of, and the continued expansion of the use WiFi enabled devices in the FJUHSD’s classrooms. June 11, 2013-The Fullerton Informer welcomes even more Fullerton parents to the other side of the story. Posted by a local parent who cares deeply about all students. I am a mom of three in Fullerton. Fullerton School District (FSD) is planning on having WiFi-enabled devices in every child’s hands. WiFi in classrooms is a new and unique environment; for our children it means 6 – 7 hrs a day, continuous exposure to electromagnetic field (EMF) radiation, put out by powerful routers, for whole school years. This has never been done before. As a mom, we naturally want our children to grow up to be healthy and productive adults. After reading what these researchers, MDs, and scientists are saying, I hope you come to the same conclusion that I do: the technology the Fullerton School District uses must be safe for our children. All of these experts are saying the same thing: WiFi in schools is not safe. DO NOT USE WiFi IN SCHOOLS. They are telling the public schools to use hard-wired technology, which is a safer and more reliable connection. Federal Communications Commission (FCC) laws have not caught up and do not address the WiFi environment that FSD plans on putting in place. Parties that stand to benefit or have a vested interest in the expansion of the technology market, most notably, the tech industry, fund the studies from other side that is saying that WiFi is safe. Much of the tech industry research is based on thermal testing, and this leads them to say that wifi in the schools is OK. The real issue is EMF radiation, not thermal damage. The EMF research cannot be refuted by the tech industry, and as time goes on the body of research accumulates. It is growing. The Fullerton School District is not telling you this information. Despite numerous attempts to get the FSD school board, principals, and teachers to acknowledge this growing body of research and evidence, it is completely ignored. This information has been presented at the Fullerton School Board meeting on three separate occasions. Fullerton School District is silent. These are our children, please read the new information that is now available to us. Let’s ask the question to FSD, “Why are you implementing wifi technology in our children’s school when so many scientists and researchers are saying it is harmful?” These are our children, let’s get involved. This propaganda piece was published right on the heels of our efforts to awaken the sleeping giant- the parents of children in the Fullerton School District, to the dangers of wireless classrooms. I just don’t get it and by the wording on that yellow piece of paper that came home with my children, it appears that neither do they. GLENDALE HAS A FREE PRESS BUT DOES FULLERTON? Who is really controlling this thing? So far, the media here in The O.C. and, specifically here in my hometown of Fullerton, which is rife with a diverse collection of media outlets, won’t touch this Fullerton School District classroom WiFi radiation business story with a ten foot pole. But up in Glendale, it appears that letters to the editor do get published. Our good friend Tony up there managed to get under someone’s skin and get them to let the cat out of the bag. Could it be that the good folks in Glendale’s local media still believe in a free press? So far, I haven’t sensed the slightest inclination that we do down here in my hometown, where even the air is better, or is it? Tony you are a good man. Does the State of California Department of Education care more about wireless technology than the children? This was sent to me by a mom in Fullerton who truly cares. The first sentence reads: “State Superintendent Tom Torlakson today hailed President Obama’s call to give more schools broadband internet access and wireless network capacity.” This, after all the letters written to LA Unified School District by MDs, PhDs, and scientists imploring LAUSD to use wired technologies. And, this is after all the pushback from the LA teacher’s union on using the wireless technology and pushback from parents across the state. As a mother of three, it is shocking that Torlakson can just turn a deaf ear to this information that is so important. How does that happen? As a mom, when you drop your child off for school in the morning, you don’t want one hair on their head harmed by being in the school environment. I certainly don’t want my children experiencing “double strand DNA breaks” or “decreased sperm motility” or headaches, leukemia, etc. What happens when a school decides for us, and makes the choice for our children, to be exposed to WiFi radiation? Does the State of California have that right? It seems as if the state believes that the Internet can only be accessed via an unsafe, wireless means. We all know that is not true. Yet, they are insisting on this. Why? Apparently, it makes no difference to Superintendent Torlakson, he won’t settle for safe and secure wired technologies. No, he prefers to risk the health of millions of California children for the sake of what? So that our children can run around with an iPad in their hands? Why doesn’t the harmful radiation make any difference to Tom Torlakson? Why isn’t he as concerned about the safety of our children as we parents? Mr. Torlakson, don’t you care about the health and welfare of our children? Why can’t you take a precautionary stance on this issue and opt for wired technologies? Well as a matter of fact from his own re-election web page,http://www.tomtorlakson.com/story we quote: ” As the chair and founder of the California Task Force on Youth and Workplace Wellness, Tom has been a leader on banning junk food from our schools, providing healthier school meals, and promoting student health and fitness”. I don’t get it. Does damaging WiFi promote health and fitness? As a mom, all I can say is that Torlakson needs to undergo the same forced irradiation as the Fullerton School District Superintendent, Dr. Pletka. So, Tom Torlakson, here you go: before our children are subjected to this UNPRECEDENTED WiFi EMF forced irradiation exposure, you must be the FIRST to step up to the plate. We, the parents, insist that you sit in a massive building with a 35,000 WiFi routers and, 1,500,000 operating iPads at legal emission levels, 6 hrs/day for 180 days/year for 12 years. At the end of that time, you tell us how that worked out for you. Since you think it is OK to forcibly irradiate on our kids, we must insist that you be forcibly irradiated in a like manner. One final thing, Mr. Torlakson, mom’s don’t take kindly to their children’s health being compromised. We take a lot of care in raising our children. We make sure they eat right, get to the doctor and dentist office when needed, and worry a whole bunch that they are growing up healthy and happy. Raising children is truly a labor of love and one filled with blood, sweat, and tears, and a lot of sleepless nights. After all of this, do you think you have the right to put our children in an unsafe environment just because you say so? A picture of the universe as we know it. We send our children to school ostensibly to be educated. They are taught to read, write, add, subtract, multiply, divide, learn about the environment, the sciences, physics, and the like. It is the great hope of many that their children will become a great leader, discover a miracle cure, or solve some of the toughest of humanity’s problems. What awaits them is brick wall a million miles tall and a caste system that some of you worship just because it works for you.